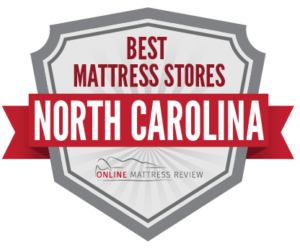 Check out our guide to the best mattress shops in North Carolina so that you know you’ll get a great night sleep. It doesn’t matter if you are a student or a professional –from the smallest of babies to the geriatric ward — at the end of the day everyone needs to get a good night’s sleep. We recognize that many of you will spend up to ? of your life on your mattress, and that purchasing a quality mattress that fits your budget is essential. We took a look at a number of the major cities and towns located across the state or North Carolina and found mattress shops that sell quality and affordable products. We also considered organic mattresses for individuals who are looking to eliminate toxins from their bedroom. Below you will find a collection of the best mattress stores in North Carolina divided into 4 of the most popular cities. Are you wondering: Where can I find a mattress store near Charlotte? If so, we’re here to help. Charlotte Mattress Warehouse (2928 Monroe Rd.) is one of the top-ranked mattress shops in the city of Charlotte. When you enter you will find a showroom filled with all of the name brand mattresses you’re familiar with as well as very helpful sales associates. This is a no-pressure sale, and you will leave satisfied with a mattress that fits you as well as your budget. Charlotte Mattress Warehouse also has a second location on South Blvd (7143 South Blvd.). Dilworth Mattress Factory is a great mattress shop that sells high-end mattresses. If you are looking for the best quality mattress money can buy, Dilworth Mattress Factory (211 W. Worthington Ave.) is the place to go. Mattress Firm does an excellent job supplying mattresses conveniently across the city of Charlotte. You will even find a Mattress Firm Final Markdown (2317 South Blvd) for those who are looking for a mattress on a budget. For quality customer service and affordable mattresses, try Mattress Firm Final Markdown. There is also a Mattress firm locate in Midtown (239 S. King Dr.) and in Southpark (4735 Sharon Rd.). Denver Mattress is located up in University City (8215 Ikea Blvd.) and is a great place to find a mattress that will fit the needs of your entire city. For a mattress store near Charlotte, this is a great spot. If you’re looking for a mattress in the Raleigh-Durham area, we can help. The Organic Bedroom (5230 Hollyridge Dr.) is a well-known chain that sells organic and non-toxic mattresses. If you are looking for a safe night sleep, and fantastic customer service to boot, try The Organic Bedroom. Fred’s Beds is a popular spot to purchase a mattress in Raleigh (8629 Glenwood Ave. You will find friendly customer service, convenient delivery, and quality mattresses for every budget. If you are looking for a very straightforward route into purchasing a mattress, try Fred’s Beds. When in the center of Raleigh, try Mattress Firm (2010 Clark Ave.). There are several Mattress Firms throughout the city making shopping for a mattress extremely convenient. Mattress Firm Clearance (7010 Glenwood Ave.) offers high quality and affordable mattresses as well as a knowledgeable staff. When in Durham, you may want to try Green Dream Beds (3401 University Dr.). Here you’ll meet an incredibly friendly and knowledgeable sales staff to help you navigate your way through the purchase of your green organic bed. If you’re tired of chemicals, and just tired, grab an organic mattress from Green Dream Beds. When in Chapel Hill, try Furniture Follies (146 Stancell Dr.). Furniture Follies may be the perfect spot to furnish your entire home! The staff is friendly, knowledgeable and efficient. Here you will find some of the best mattresses in terms of quality and price. You won’t be a fool if you shop at Furniture Follies. If you are looking for a mattress store in Winston-Salem, you should try Mattress Center (1268 S. Stratford Rd.). Mattress Center offers custom-built mattresses and great customer service. Mattress Center will order mattresses for you or allow you to shop for mattresses directly on the floor. The mattresses in stock are locally made. There are a number of Mattress Firms located across the Winston-Salem area and one of the highest ranked is actually the Mattress Firm Final Markdown (909 Hanes Mall Blvd.). If you are not pleased with your mattress, Mattress Firm Final Markdown does honor the 120 day money back guarantee. If you are wondering where to find a mattress in Asheville, you may want to start with Affordable Bedding Inc (996 Patton Ave.). Affordable Bedding Inc. is a great mattress shop that is locally owned and family-run. You will be welcomed in, encouraged to try mattresses that will fit your sleep style, and leave with a mattress that fits you and your budget. Another Asheville family-run business is Mattress Man (85 Tunnel Rd.) where you’ll find a large selection of beds and mattresses. The staff is extremely professional and knows the topic very well. You won’t be pressured into making a purchase as the staff is considerate and patient. This is a great place you’ll want to return to again and again. There are many places throughout Asheville to find the perfect mattress. If you are looking for a mattress near Asheville, you could try Nest Organics where you’ll find organic and toxin-free mattresses.